BBC coverage: Live radio and text commentary on every match on Radio 5 live or sports extra, plus desktop, tablets, mobiles and app. England seamer Chris Woakes says he is "obviously keen to carry on" taking the new ball in the forthcoming World Cup. Woakes took 5-19 from 7.3 overs in Monday's nine-wicket warm-up win over West Indies, including two wickets in successive balls in the first over. 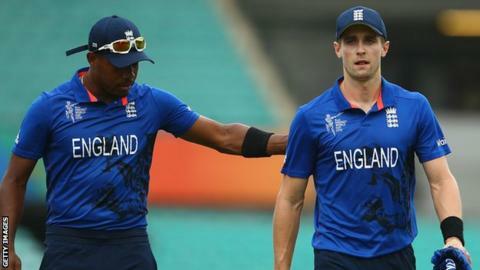 "I'd be more than happy to continue that role, but whatever role I'm given I'll try and do my best for England," Woakes, 25, told BBC Sport. "I've done it for a while now and it's nice to have the responsibility." Woakes led the England attack alongside Steven Finn in their one-day series defeat in Sri Lanka before Christmas while James Anderson and Stuart Broad were rested. Although the experienced pair returned for January's tri-series against Australia and India, Anderson and Woakes took the new ball with Broad as first change. Woakes was pleased to bounce back after conceding 89 runs in his 10 overs as Australia romped to victory in the tri-series final. "It's always nice to get back in the shirt and try and get a performance on the board as soon as possible," the Warwickshire man said. "I think I showed what I can do in Sri Lanka when those guys weren't there. "We had to put our hands up and bowl those tough overs which was a great experience for us." The Windies were bowled out for 122 after Woakes did the damage in the first over - removing Chris Gayle and Darren Bravo for first-ball ducks before Marlon Samuels nearly edged the hat-trick delivery - before England sailed to a nine-wicket victory. Despite a disappointing display by their opponents, Woakes said: "You can only play against what is in front of you but we made it difficult for the West Indies batsmen. "It was good to see the back of Chris Gayle early, but winning inside 25 overs is a great achievement. "There may have been a couple of loose shots in there, but when you have a team four down in the first 10 overs, it's tricky to come back from that. "It would have been nice for our batsmen to have a bit of a run in the middle but there is always Wednesday which may bring us a stiffer challenge." Wednesday's game sees England face Pakistan in their final warm-up at the same venue, before they travel to Melbourne for Saturday's World Cup opener against co-hosts Australia.